Here is a page we started Friday and the kids completed over the weekend. 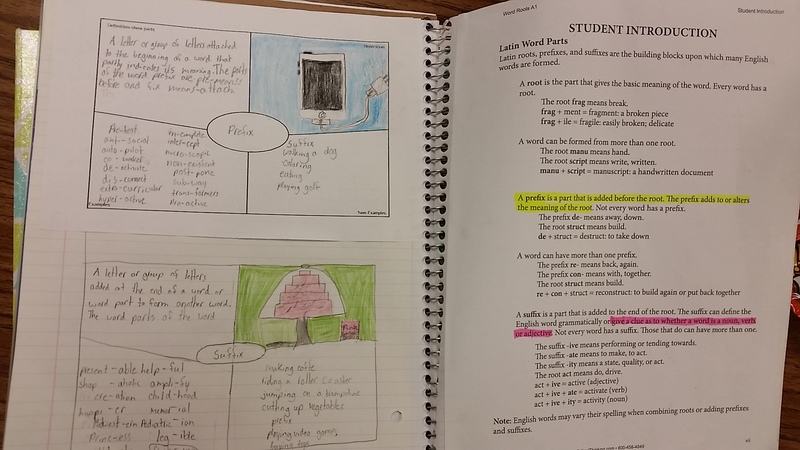 On my page on the right is an introduction to affixes and word roots. I used their page to introduce Frayer models. If you aren’t familiar with Frayer models, they are an in-depth vocabulary graphic organizer, and they are on of the recommended Marzano strategies to focus on similarities and differences. A typical Frayer model has the word in the middle, a definition in the upper left, an illustration in the upper right, examples in the lower left, and non-examples in the lower right. Because improving my scores in acquisition of vocabulary is a target for me this year, I tweaked the definition box. In addition to a standard definition, they have to break the word into parts and define each, prefix, root, and suffix that makes up the word. I also have lowered the center oval to create a larger area for the definition and the illustration. I supplied the kids with one model and then they were responsible for recreating it the second time. To extend them on this page, they had to use two of the three word parts (prefix, suffix, and root word) for their center word. 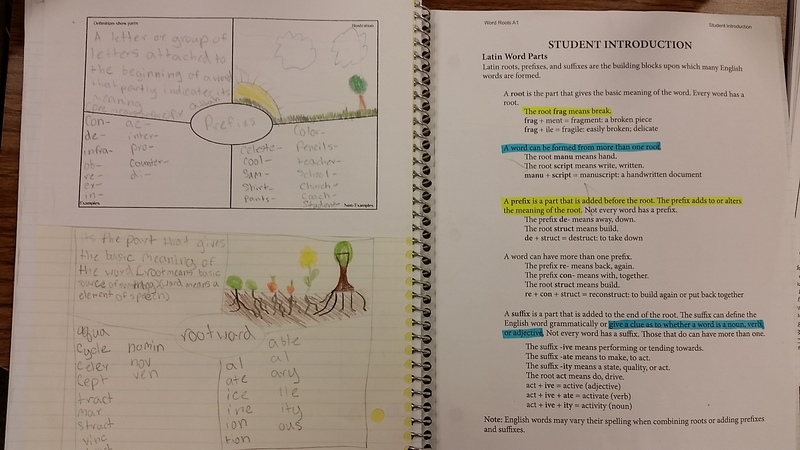 They were allowed to use any resource to find the meanings of pre-, suf-, fix,root, and word. I let them work together to break the words into parts and find the definitions, but solo on the rest of the Frayer model. When we set up our notebooks, I followed the advice on many of the websites to have the kids prenumber their pages to 100. I made the mistake of assuming 5th graders knew left from right and could follow simple directions as to setting up the notebooks. Now we have numbered pages that don’t match my running example and kids putting my materials on their side and then having to do their work on my side. If I hadn’t had them number all the way through, we could tear out pages and glue them again. The Elmer’s really does its job. Once the pages are in there, you aren’t getting them out unless you catch it right away. Next year, I’ll know to monitor that much more closely. Posted on August 25, 2014 by sslateacher	• This entry was posted in Uncategorized. Bookmark the permalink.